Rollable OLED displays are exciting - as these displays can enable new device form factors - such as TVs that roll up into a small cylinder or a tablet-sized device that can roll-up into a pen. In early 2019, LG launched the world's first rollable OLED device - a TV that rolls into its base. The 65" Signature OLED TV R has three viewing options - full view, line view and zero view. This is a radical new TV form factor, which will be probably be highly expensive when it starts shipping during 2019 (we still do not know the exact release date and price). The TV offers the highest image quality - enabled by OLED technology. While LG is leading the race to rollable OLED TVs, many display makers are developing smaller rollable OLED displays for mobile devices. Back in 2016, for example Samsung Display demonstrated a beautiful rollable OLED, a 5.7" display that featured a Full-HD resolution (386 PPI) and a curvature radius of 10 mm. The whole display is 0.3 mm thick and weighs 5 grams. We do not know yet when SDC plans to commercialize such a display (the company is currently focused on developing its foldable OLEDs). In January 2018 LG Display unveiled its largest OLED TV panel yet - a 88" 88-inch 8K (7680x4320) display. In early 2019 LG Electronics announced that it will adopt this panel in its upcoming OLED Z9 88" OLED TV. 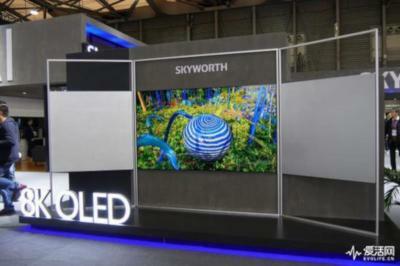 Yesterday in Shanghai at the Appliance & Electronics World Expo 2019 (AWE2019) Skyworth demonstrates its own 88" 8K OLED TV. We do not have any details on this TV, and whether it is just a prototype or a product that Skyworth aims to launch soon. In any case it turns out that Skyworth already demonstrated this TV at CES 2019, but we failed to report on that. In addition to the large OLED, Skyworth also demonstrated a new OLED TV design which they call waterfall OLED - look at the image below to understand why. It is not clear but it is likely that this is a prototype rollable OLED TV. UBI Research estimates that the OLED market will reach $32.2 billion in revenues, up from 13.8% from 2018. UBI says the the growth will come from new applications - including foldable smartphone displays, 8K OLED TVs and rollable OLED TVs. Increased yields by Chinese AMOLED makers will also contribute to the growth. AMOLED revenues in Q4 2018 reached $7.9 billion (down 3.7% from Q3 2018 and 10.4% from Q4 2017). In the whole of 2018, revenues reached $28.3 billion, up 7.1% from 2017 ($26.4 billion). UBI sees the oversupply in the flexible OLED market to continue as high prices prevent adoption in mid-end smartphones. At CES 2019, LG Electronics announced its first rollable TV (and the world's first rollable OLED device), the 65" Signature OLED TV R. Market analysts from IHS estimate that producing each 65" rollable OLED TV will cost over $3,000 - more than three times the cost of production of LG's regular 65" OLED TV panels. LG's new TV can roll up into its base, and has three viewing options - full view, line view and zero view. In Line View, there are six different modes, in which the TV can show the weather, the time, a home dashboard and more. Like the rest of LG's 2019 OLED range, the OLED TV R is based on the company's 2nd-gen Alpha 9 intelligent processor the enables LG's ThinQ AI to offer new display algorithms and Amazon's Alexa and Google's Assistant. As was reported last month, LG Electronics announced its first rollable TV (and the world's first rollable OLED device), the 65" Signature OLED TV R. LG's new TV can roll up into its base, and has three viewing options - full view, line view and zero view. In Line View, there are six different modes, in which the TV can show the weather, the time, a home dashboard and more. LG's OLED TV R, like the rest of LG's 2019 OLED range, is based on the company's 2nd-gen Alpha 9 intelligent processor the enables LG's ThinQ AI to offer new display algorithms and Amazon's Alexa and Google's Assistant. The TV also features HDMI 2.1, high frame rate (HFR) support, enhanced audio return channel (eARC), variable refresh rate (VRR) and automatic low latency mode (ALLM). LG's flagship OLED also feature Dolby Atmos for immersive entertainment. LG Display has already demonstrated rollable OLED TVs (and according to reports it aims to release the first such TV to the market in 2019) - but Samsung has been left behind as its current LCD-QLED TV technology choice does not enable rollable TVs. LGD's prototype rollable TV (unveiled in 2018) rolls vertically, inside a single case at the bottom. 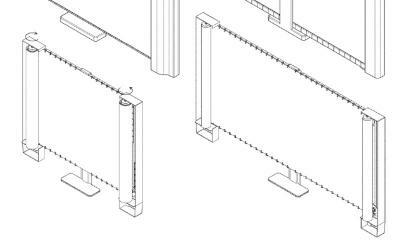 According to a new patent recently awarded in the US (USPTO #10,162,387) Samsung has a different design in mind - a TV that rolls horizontally, as you can see in the image above. In CES 2018, LG Electronics demonstrated its 65" rollable OLED TV prototype, showing how such a display can be used to create a TV that rolls into its base. Last month we reported that LG plans to showcase its rollable TV again at CES 2019, and now Bloomberg reports that LG aims to actually release this TV as a commercial product in 2019, citing "a person familiar with the matter". It was already reported before that the rollable TV will take "center stage" in LG's CES event - which hinted that LG is indeed close to commercializing such a device. In 2017, LGD did say it plans to bring rollable OLED TVs to market by 2020. The Fraunhofer FEP institute, the Holst Center and other partners have developed a 15-meter long OLED lighting panel, the longer OLED device ever (beating their own 2017 record of a 10-meter OLED). This work was done as part of the Lyteus, the EU's €14 million initiative within PI-SCALE. The partners in this project say that this is the first OLED produced using a new unique roll-to-roll (R2R) process that combines the performance of an evaporated OLED stack with solution processing of auxiliary layers. LG Electronics demonstrated its 65" rollable OLED TV prototype in 2018, showing how such a display can be used to create a TV that rolls into its base. Engadget says that LG has plans to showcase a rollable TV again in CES 2019 (January 9-11). Engadget says that according to its information the rollable TV will take "center stage" in next year's event - which may point to the fact that LG is close to commercializing such a TV. In 2017 LGD did say it plans to bring rollable OLED TVs to market by 2020. A team at Queen's University Human Media Lab in Canada developed a new concept device called MagicScroll that features a rollable display wrapped around a cylinder that can be rolled to scroll the information. The display can also be rolled up to act like a regular tablet. 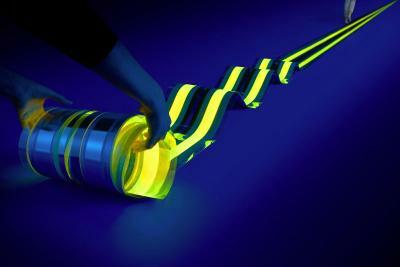 The display used in this demonstration is a 7.6" 2K rollable OLED. This is actually a tiled display made from two 5.5" FHD OLEDs taken from two LG Flex 2 smartphones (thank you Andrew M. Abrams from SCMR for clarifying this!). China-based AMOLED producer EverDisplay has recently demonstrated several flexible AMOLED prototypes at a trade show in China. 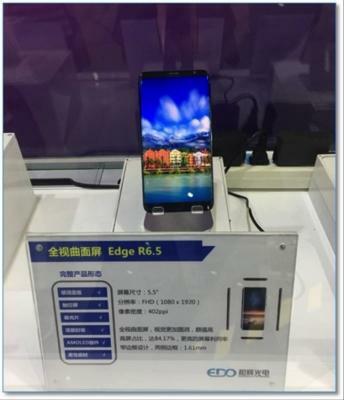 First up we the edge-type 5.5" FHD (402 PPI) AMOLED display, with a curvature radius of R6.5. The thickness of this display is 1.61 mm.